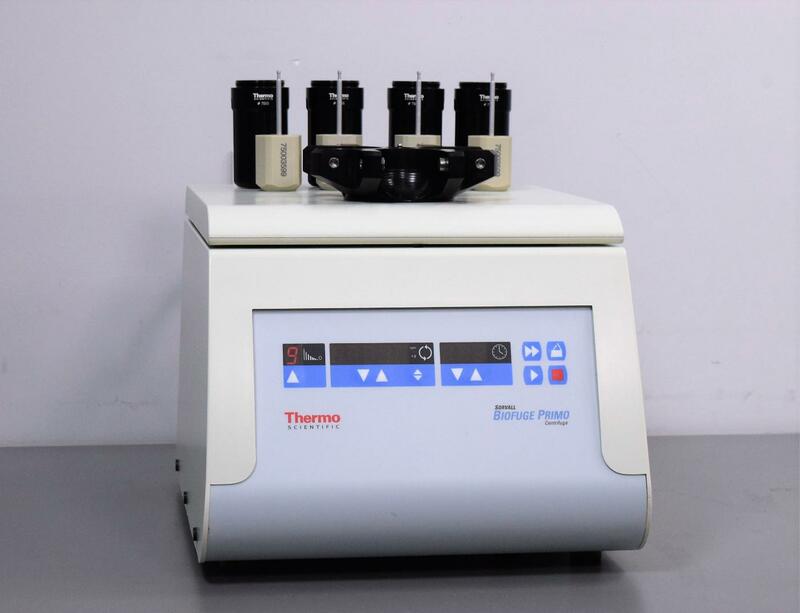 Thermo Fisher Sorvall Biofuge Primo Benchtop Centrifuge w/ Rotor & Buckets . New Life Scientific, Inc.
With the current combination, four 5mL blood collection tubes can be processed. In his testing, our technician ran the system at 4,000 RPM, the max speed of the included rotor. He also tested the maximum and minimum acceleration/deceleration profiles and tested pulse mode. No issues arose. We are confident in the machine’s functionality. New Life Scientific is no stranger to centrifuges. Over the past four years we have worked on a wide variety of benchtop and floor centrifuges from leading manufacturers, including Beckman, Sorvall/Dupont/Thermo, and Eppendorf. You can have confidence in our technical evaluations and our warranty knowing that we have in-house technicians who inspect, test, service, and repair centrifuges. After examination and thorough cleaning, these instruments often leave our shop meeting manufacturer specs. When you buy from us, you’re not just buying a centrifuge. You also gain a resource for after-sales support, even after your warranty expires. The Biofuge Primo offers the best of three centrifuges - microliter support, general purpose use, and high speed. Buying pre-owned can be unnerving. We know you want assurance in your purchase, so we include a 90-day warranty with our equipment. If anything goes wrong, our in-house support is only a phone-call away. We also offer continued support, including consulting and technical questions. We may be able to exchange or replace units in a pinch.